Moulds are part of the fungus family and are very common organisms that include mushrooms and yeast. They are found indoors and outdoors. Moulds can be harmful or helpful depending on their location. They will grow readily in wet or damp areas, including wallpaper, ceiling tiles, carpets, insulating material, wood and drywall. Mould does not grow on dry materials. Mould can trigger nasal congestion, sneezing, coughing, wheezing, respiratory infections and headaches. It can worsen asthma and allergic reactions. If you experience these symptoms, you should talk with a doctor. There are a few things you can do in your home to prevent mould from starting to grow. Keep your home dry. Avoid excessive use of humidifiers, and limit activities that increase moisture in the home. Ensure that exhaust fans in the kitchen and bathroom are used when there is moisture in the air. Open windows when possible. Any source of water or moisture needs to be located, assessed, and as much as possible, be eliminated or controlled. Some examples would be to repair a leaking roof, assure the rainwater downspouts are draining away from the house, leave the bathroom fan on (or open the window) for at least 15 minutes after a shower or bath, and regularly wipe window sills when condensation forms. Small areas (less than one square metre) and moderate areas (less than three square metres) of mould can be cleaned safely by following the recommendations below. 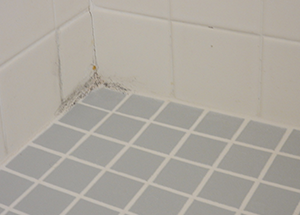 Common examples of mould and mildew build-up are found in the corners of shower stalls near grout. When cleaning a concrete surface that has a moderate amount of mould, TSP (tri-sodium phosphate) can be used. It must not come into contact with your eyes or skin. When cleaning a moderate amount of mould on drywall repeatedly, the moisture from cleaning can eventually add to the problem and damage the facing. In certain circumstances the affected drywall area may need to be cut out and replaced. The underlying moisture / water issue needs to be corrected first and then replace the drywall and affected materials as needed. Extensive amounts of mould should not be cleaned up by you. 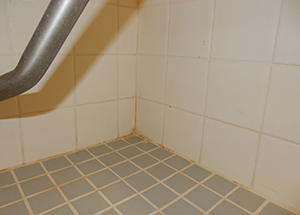 A patch or total amount of mould that is more than three square metres is extensive. Professional help can determine why the mould is present, and clean the area without causing any adverse health effects to yourself or other residents. Help can be found in the Yellow Pages under Environmental Services, Mould Remediation or Restoration.